Park at Humbleton (NT977285) and, with the telephone box on your right, turn left up a gently rising gravel track. Continue with this track uphill and when it splits in two ( by then it has become a green track ) be sure to take the right hand spur. 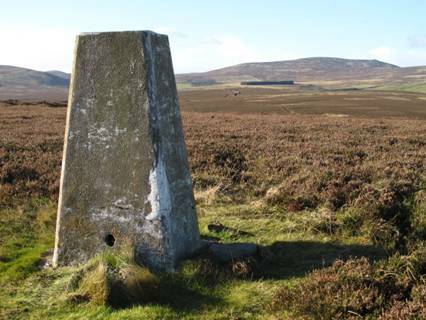 This climbs around the northern flanks of Coldberry Hill and onto the extensive heather moor. A further mile of easy walking will bring you to the highest point of the track and level with the summit of Gains Law. Turn right to follow a thin trace through the heather to the trig point. Superb views towards Yeavering Bell, Newton Tors and the more distant Cheviot.